Check out additional information below on AUDREY II! Q: How much does an AUDREY II rental package cost? A: All rentals are based on performance venue type, house size, ticket prices and weeks of rental. Each contract is different and discussed individually with the client. Q: How do I hold production dates for booking an AUDREY II rental package? A: Once you have decided that you want to rent AUDREY II and have filled out an INITIAL RENTAL REQUEST, ImaginationWorks will require a non-refundable INITIAL HOLDING FEE (determined by total rental cost) to lock in your request dates. Dates are not locked down until the check is received. This holding fee is applied to your total overall rental fee. Q: When are rental fees due for my AUDREY II rental package? A: ALL rental fees are paid UPFRONT IN ADVANCE before any rental package will be available. Final fees are due no later than 10 BUSINESS DAYS prior to pickup. Q: Do you have any shipping options for the AUDREY II rental package? A: ONLY SELF-PICKUP SHIPPING IS AVAILABLE AT THIS TIME. You will need to transport the plants yourself with a U-HAUL truck or similar commercial vehicle - 17' vehicle recommended. Renter is solely responsible for booking the commercial truck and all financial arrangements. A separate contract is required for self pickup and return. 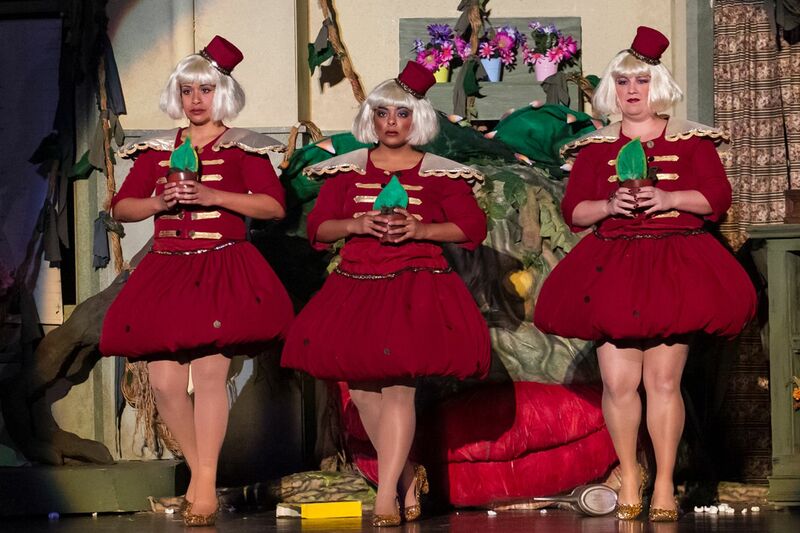 Q: How do I train my puppeteers to use AUDREY II? A: Created from over 20 years of experience working with this glorious, man-eating monster, ImaginationWorks will proviode you with a training manual specifically based on our plant designs. The manual takes you through the ins and outs of Audrey II from start to finish. Also, a free puppet training session with a puppet master from ImaginationWorks may be available, pending if your performance venue is local. Q: What happens if AUDREY II is damaged during our rental period? A: There is a required $500.00 security deposit that ImaginationWorks holds during your rental period. Once the plants are returned, we evaluate them for excessive damage and abuse. Any damages will be reported to you and fees will be deducted accordingly from your security deposit. Our contracts describe clearly how to handle and care for the plants. Very rarely have we experienced any damages beyond normal wear and tear that occurs during regular rehearsals and performances. Q: If I want to add shows to my original production schedule, how do I extend my rental contract? A: Please alert ImaginationWorks immediately. Bookings usually occur back to back but down time may occur between rentals. Once an extension is approved, all current contract details remain intact and you just mail us the extension fees within 48 hours of signing the extension. 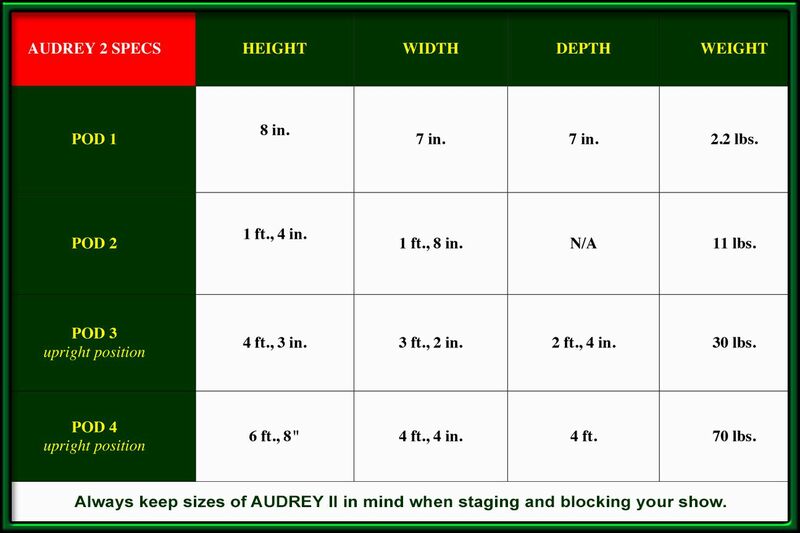 When staging your production of LITTLE SHOP OF HORRORS, be sure to refer to our stage specs for the different sizes of AUDREY II puppets. This plant is hungry and grows to be one big ol' girl! WEBSITE PHOTOS CREDIT: All photos courtesy of TheatreWorks Florida; Orlando Fringe Festival 2012; winner of "Best In Fest". Cast: Kevin Ryan Cole, Caroline Elizabeth Drage, Frank Siano, Casey Sweeney, Desiree Perez, Katrina Johnson, Jennifer Roman, Jamaal Solomon and Andrew Johnson. Photography: Tiffany Bagwell.